Stronger & softer wipes (in consumer cleaning conditions). Fast and powerful cleaning. Cuts through grease and dirt. Contains no bleach and no need to rinse. All purpose cleaning wipes. 30 Large wipes that can be divided into 2, which gives you 60 wipes. Flash all purpose cleaning wipes easily clean all hard washable surfaces, leaving behind a fresh, clean scent. 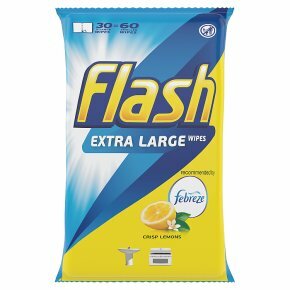 Flash wipes are perfect for quick clean-ups all around the house or when you are away from home, they are convenient and easy to use for every day cleaning. On top, their disposability makes it more hygienic to clean germy places. These multipurpose cleaning wipes quickly remove grease stains, burnt on food, dirt and soap scum. Use the cleansing wipes to clean the kitchen, the bathroom and on all hard washable surfaces like countertops, walls, floors, oven, sink, fridge, bins, baths & taps, toilet seats, high chairs, electrical devices. Do not use for personal hygiene. Keep away from children. Keep away from eyes. If product gets into eyes rinse thoroughly with water. Rinse hands after use.